Our professional external management audit of your foreign operations will provide you with a clear picture of the state your abroad business is in. With focus on the initial set-up, processes, people, assortment and products up to communications and marketing, we not only depict but also remove the identified obstacles on your road to success abroad. In addition you can rely on our sales- and marketing upgrade which provides you with a successful lead generation process and pipeline in the future. 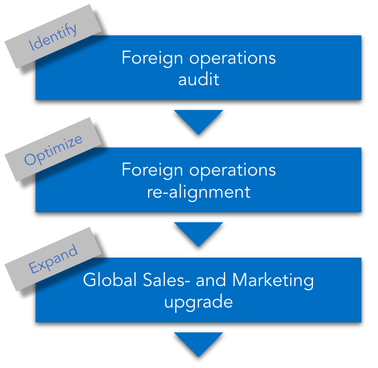 Contact us now for your individual offer on foreign operations optimization.